There’s been a lot of discussion about LGBT rights in Singapore lately, and considering how complex the topic is it looks like that conversation will continue for the foreseeable future. As is the case with most hot-button issues, sides are going to be taken, and it’s pretty clear where Golden Village stands. For the past nine years, the cinema chain has proudly played host to the Love & Pride Film Festival, a screening of LGBT-focused films curated by the Singapore Film Society. As one of Golden Village’s most popular events (you don’t do something for nine straight years if it’s not in demand), it’s no surprise that the festival will return for its 10th edition this October, showcasing six independent films from all around the world over nine days. This year’s selection revolves around the theme of Acceptance, and seeks to resonate with not just the LGBT community, but straight audiences as well. 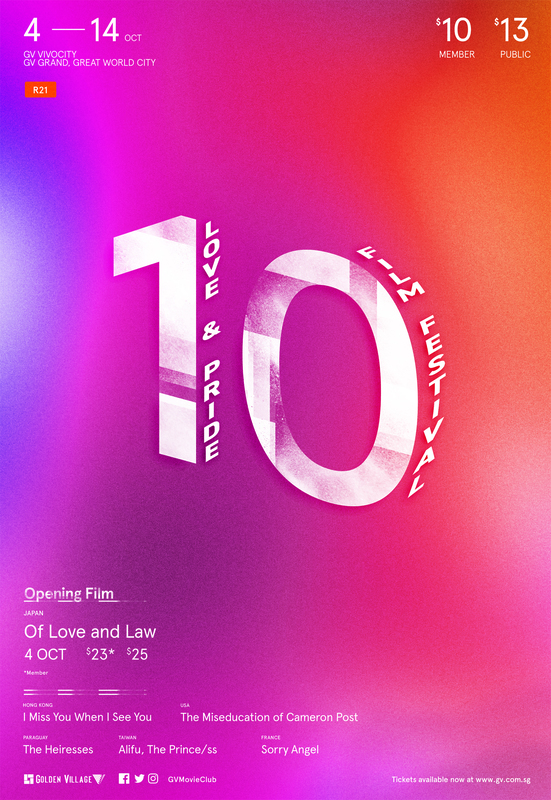 The festival will open with Of Love And Law, an award-winning documentary that follows two lovers who run Japan’s only LGBT law firm and the discrimination they and their clients face. After the screening, there’ll also be a 30-minute Skype Q&A with director Hikaru Toda, which for film enthusiasts will be worth the price of admission alone. Another must-watch is The Miseducation of Cameron Post, which won the Grand Jury Prize at this year’s Sundance film festival. Starring Chloë Grace Moretz and based on the 2012 novel of the same name, this coming-of-age film shines a light on the controversial practice of conversion therapy and its “de-gaying” methods. Other films include include Sorry Angel (France), The Heiresses (Paraguay), I Miss You When I See You (Hong Kong) and Alifu, The Prince/ss (Taiwan). Tickets for opening night are going at $23 and $25 for GV movie club members and the public respectively, while the other screenings are priced at $10 and $13. You can get your tickets from 20th September onwards at Golden Village Cinemas, their website or the iGV app, so mark your calendars to avoid disappointment.